Home Apple TechBuzz iPhone 6′s Sapphire Screen Pics Leaked – Have A Look! iPhone 6′s Sapphire Screen Pics Leaked – Have A Look! As the world inches closer and closer to the month of September, all eyes and ears are searching for anything that might give them more clues as to what to expect from Apple’s iPhone 6. Recent leaks (if you believe they’re genuine) show 2 bigger screen sizes for the popular phone – a 4.7 inch model and a larger, 5.5 inch big-brother. The leaked images also show the phone being more curved than we’re used to. Yet another rumor which has been circulating for some time is that Apple’s going to use sapphire to create the screen for their new flagship phone. There may be some actual truth to those latter rumors, and it seems one lucky person got his hands on the front panel of the new iPhone 6 and (of course) made a video of his findings. And let me tell you – the video seems legitimate. Whether it is or not, you’ll have to be the judge of that. We’ll post the video below for your viewing pleasure. Talk About A Screen Protector! In case you didn’t know, Apple has used Gorilla Glass in the past to protect the front screens of their iPhones, but apparently Gorilla Glass has nothing on sapphire. While sapphire is more expensive, it’s also a lot stronger – and thinner. In fact, as the video shows, it’s only as thick as a piece of notebook paper. 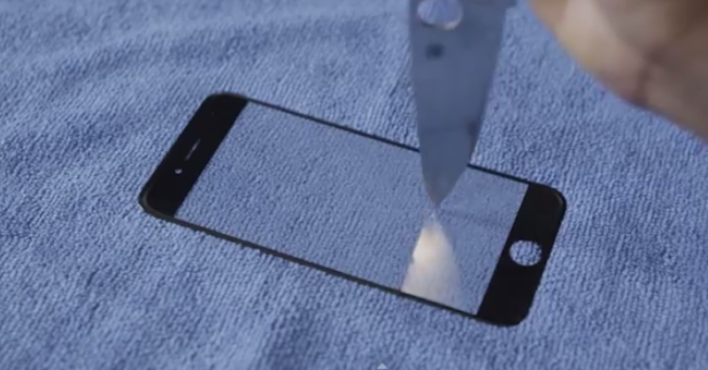 The video (thanks to Marques Brownlee) also shows him doing everything he can to scratch and damage the sapphire screen – using keys, a knife, etc. If this sapphire is as strong as it seems, it could mean the days of iPhone users needing to use a screen protector are over – and who would complain about that? We’ll have to wait a little bit to see how durable the whole iPhone 6 is, though, as admittedly this is only the front part of the screen. In other good news, it seems both larger sizes of the iPhone 6 (and not just the 5.5 inch screen) will feature the sapphire screen.